I took the time (and money) to try them all, this are my findings. Released on August 20, 2011, this is the newest contender in the ring. The description claims that “you can keep up-to-date with the elegant interface provided by native iOS controls” but I think that claim is far fetched. Within the app, you can only read the headlines and comments. The hierarchy of the comments is not preserved, so you end up with one big mess. To view the original article or make any sense of the comments, you have to open Safari. Without hierarchy, comments are one big mess. No article to see here, move along! Hacker News Reader does get a couple of things right, though. You can not only access the articles from the frontpage, but also the new articles, as well as the categories Classic, Best and Ask HN. It supports landscape and potrait orientation and multitasking, which goes not without saying. It is a universal app, so you can use it on your iPhone too, but in the current state, you probably don’t want to. When I first tried Hacker News!, I had iOS 5 beta installed and it kept crashing upon start. I then proceeded to downgrade to iOS 4.3.5 which led to my iPad getting stuck in recovery mode and taking about two evenings to convince it the go into DFU mode. But I disgress. Once I had iOS 4.3.5 running, the app still crashed, despite the fact that the description says “NEW VERSION! All bugs fixed!”. After a couple of tries, I got it to work, but it never was really stable. That is a pity, because the app looks actually quite promising. The interface looks polished, the layout resembles the mail app. Depending whether the iPad is in landscape or portrait mode, you can select an article from a column on the left or a popover respectively. There is a switch view to the frontpage, new, best and Ask HN articles, but that doesn’t work. The comments are displayed with a native look, although it hasn’t been updated to look nicely without the number of votes on comments. A unique feature of the app is that you can vote on articles and comments in the app, although it is bit unreliable, because you don’t get feedback if you are not logged in. It also integrates Instapaper and Readability, but it wasn’t running long enough to test it. All in all, the app has a lot of potential, but it’s currently disqualified by the stability issues. Once those are fixed, it might be worth a second look. As the last update was in May, I’m not holding my breath. 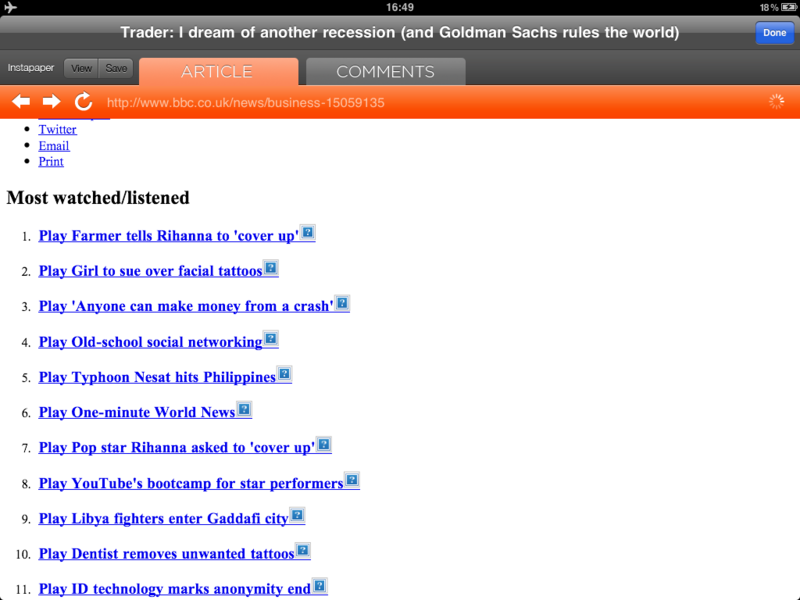 The first impression isn’t the strength of Hacker News Padreader. 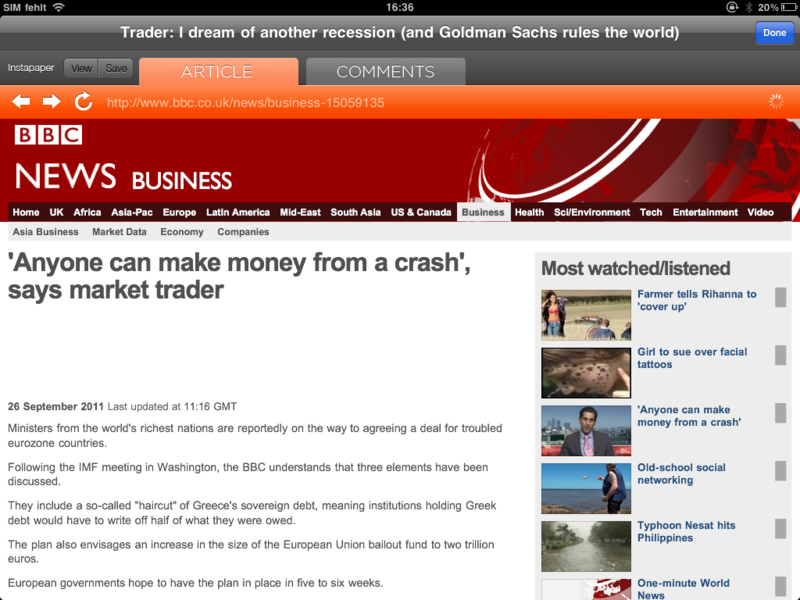 The way it presents the articles from the front page is pretty… native. The layout is similar to the Twitter app. 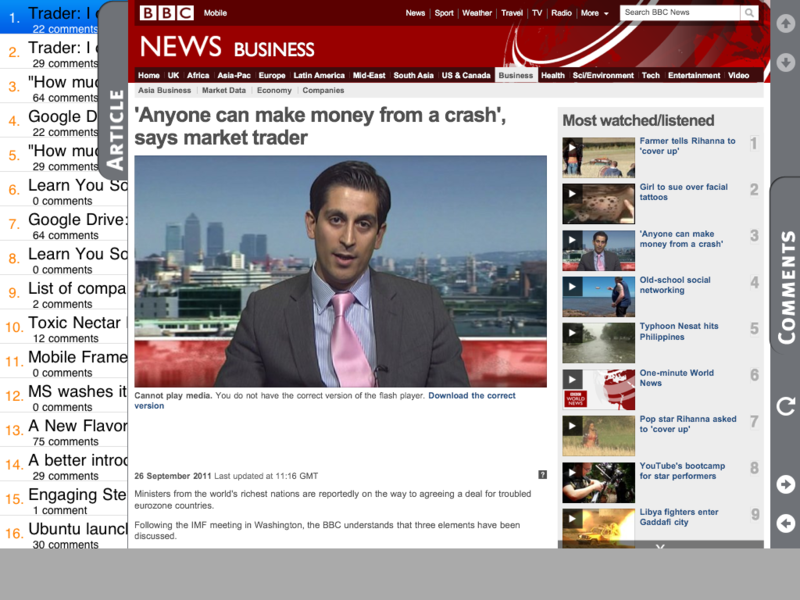 If you select an article, a tab with the content slides in, covering most of the article list. A separate tab contains the original HN comments page for an article. You can login, write comments and upvote an article as you are used to. The article tab has two arrows, which should probably navigate to previous or next article, but they didn’t work for me. The app has a gray area on the bottom, which should probably contain an ad. Hacker News Padreader is landscape only and lacks a couple of features like Instapaper integration or a way to open an article in Safari. Despite these shortcomings, it is still an improvement over the Hacker News website. YMMV, but for free, it is worth giving it a try. 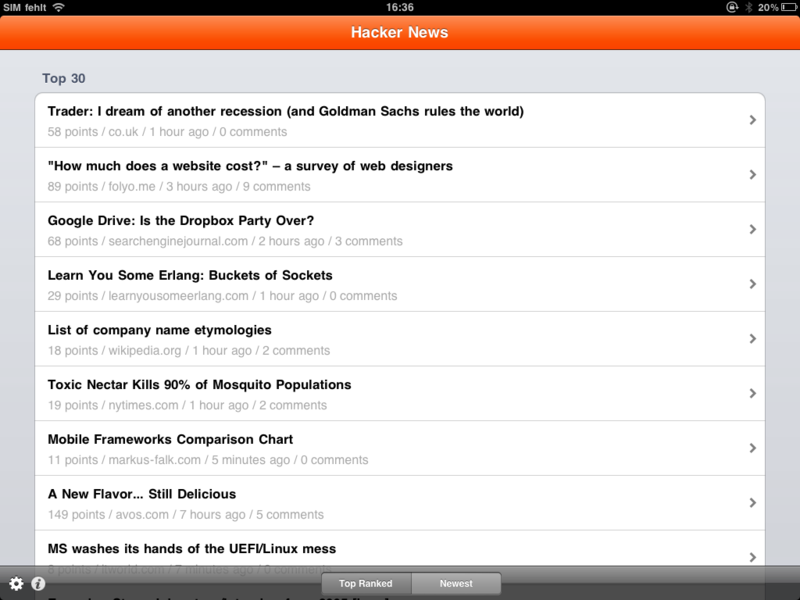 After two bad and one okay-ish app, Hacker News HD is a nice change. The article list shows that a native look doesn’t have to be ugly. 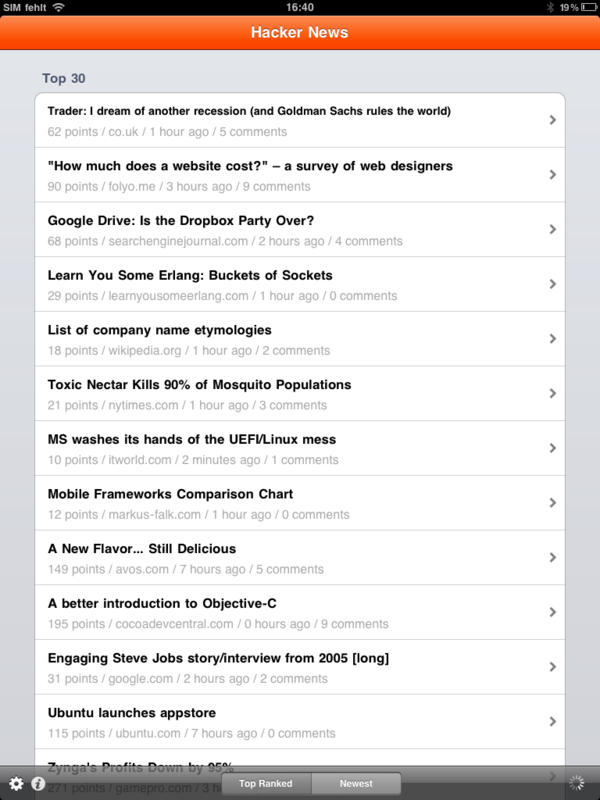 You can only toggle between Top Ranked and Newest articles, but that is probably enough for most people. If you tap a headline, the article is loaded in a modal dialog. Tabs on the top allow you switch between the article and the comments. Like Hacker News Padreader, the comments are displayed using the original HN comments page, allowing you to comment and vote as you know it. “Read later” and “Read Now” functionality through Instapaper is integrated. The real killer feature hides in the Settings dialog: Hacker News HD lets you view articles offline. You can choose if you want to cache the original article or the Instapaper version or both. Unfortunately, it doesn’t cache CSS or images, which makes reading a cached article quite uncomfortable. Reading the cached Instapaper version works just fine, unless the article contains essential images. 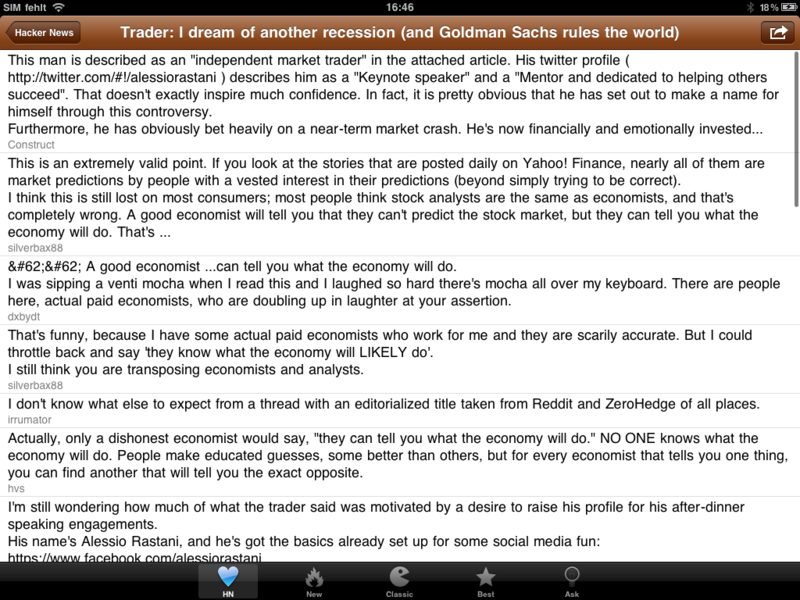 Hacker News HD works both in potrait and landscape mode, but it isn’t really optimized for it. Unfortunately, it doesn’t support multitasking. If you leave the app, you always have to start from the article list. Update: Two people commented that Hacker News HD keeps crashing for them. 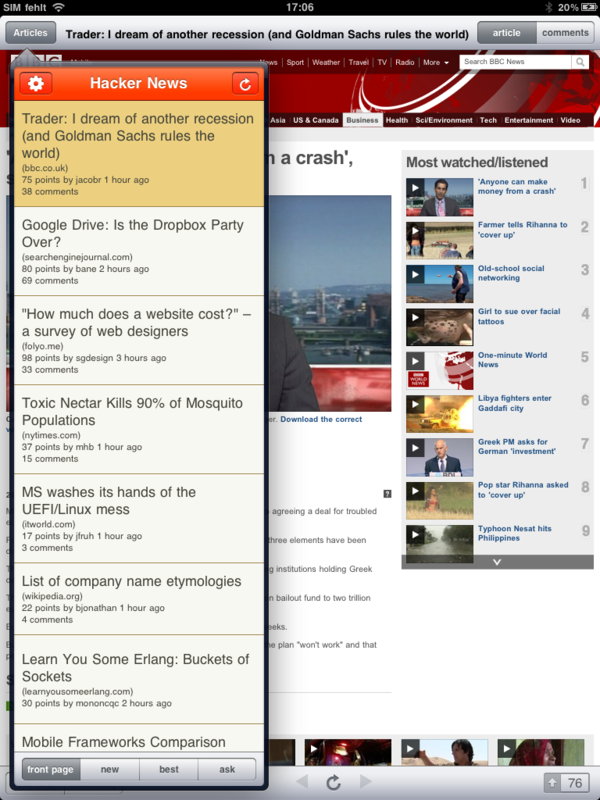 Like Hacker News!, the layout of this app resembles the Mail application, with a column of headlines on the left in landscape mode or a popover in portrait mode. If you start the app, it shows the HN homepage on the right, which is kind of confusing, because it is in no way connected to the column on the left. In potrait mode, it is even more confusing, because it’s not obvious that the button on the title bar open the article list. But once you figured that out, the app is a great way to browse Hacker news. If you select a headline from the list, it loads in the main area. 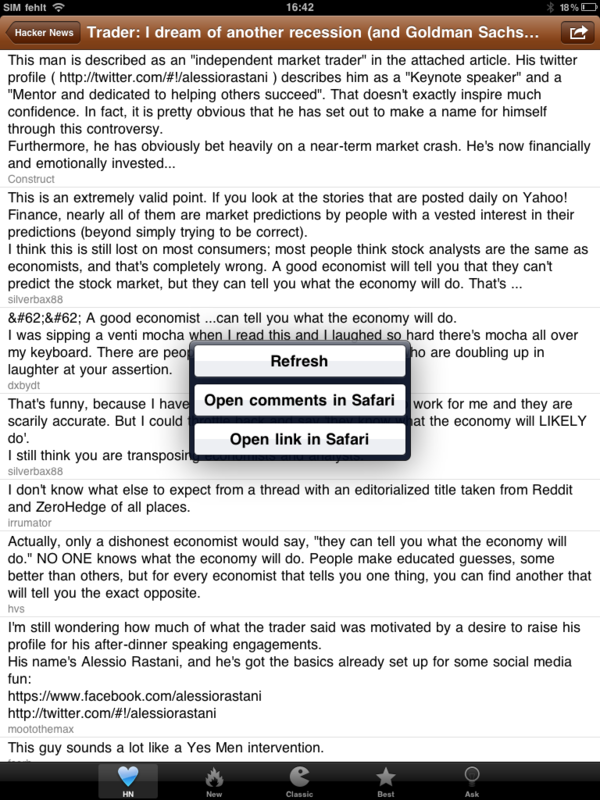 A toggle button allows you to quickly switch between the article and comments. 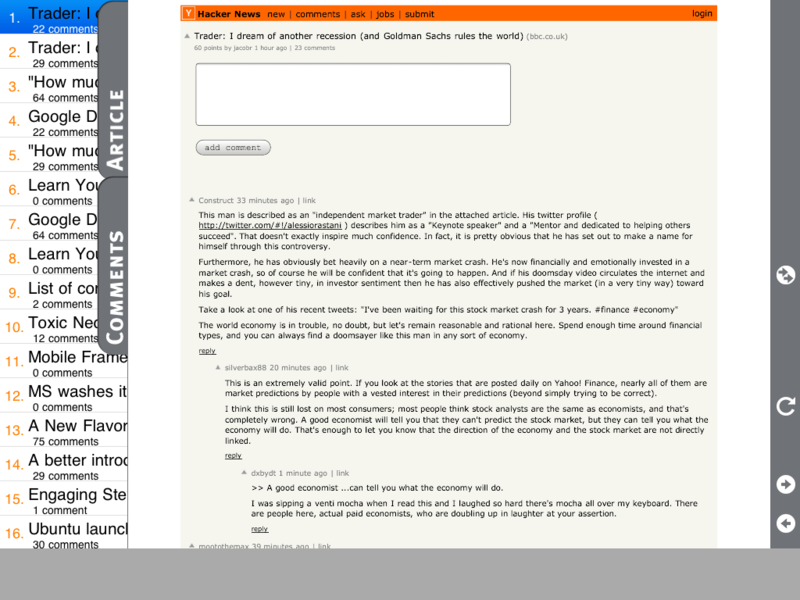 Like in Hacker News HD, the comments view are simply a webview with the HN comment page. Arrows on the bottom let you quickly navigate to the previous and next articles. You can save articles to Instapaper or open them in Safari, a readability mode is not available. Unfortunately, it doesn’t support multitasking and always starts over once you return to the app. None of the available apps is perfect and all of them have room for improvement. I’m the last person the underestimate the time it takes to create a polished iOS application, but I think that both HackerNews for iPad and Hacker News HD could be really great apps with just a bit more effort. 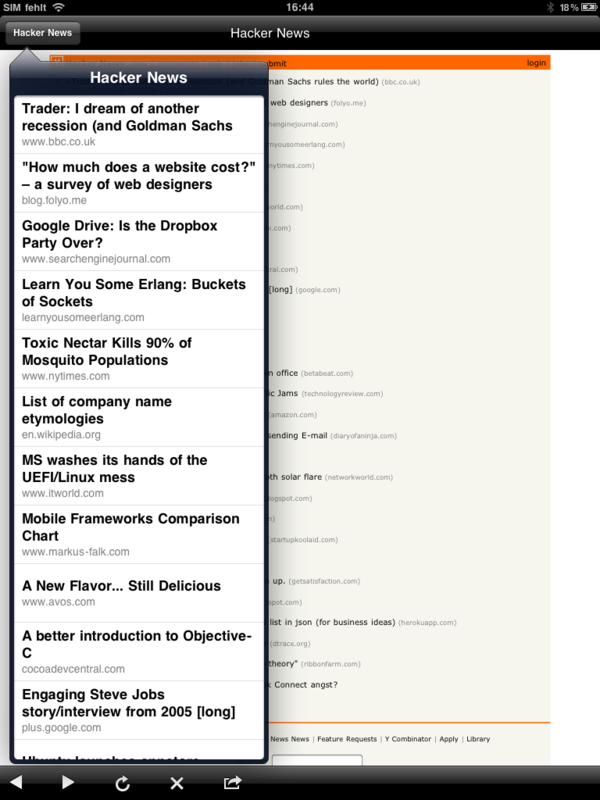 All things considered, HackerNews for iPad offers the best browsing experience of all available apps. 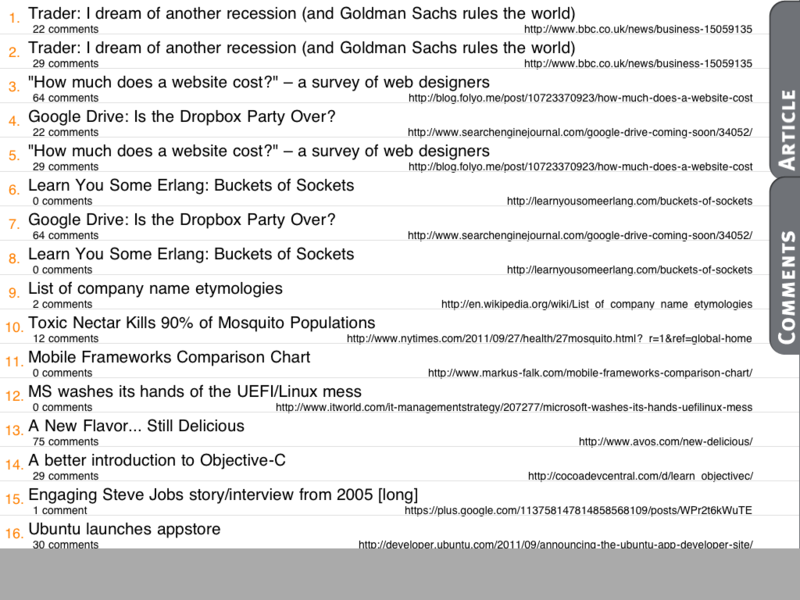 It is definitely an improvement over the Hacker News website and well worth one buck. If you regularily find yourself without internet connection or can’t live without Readability, you might consider Hacker News HD. 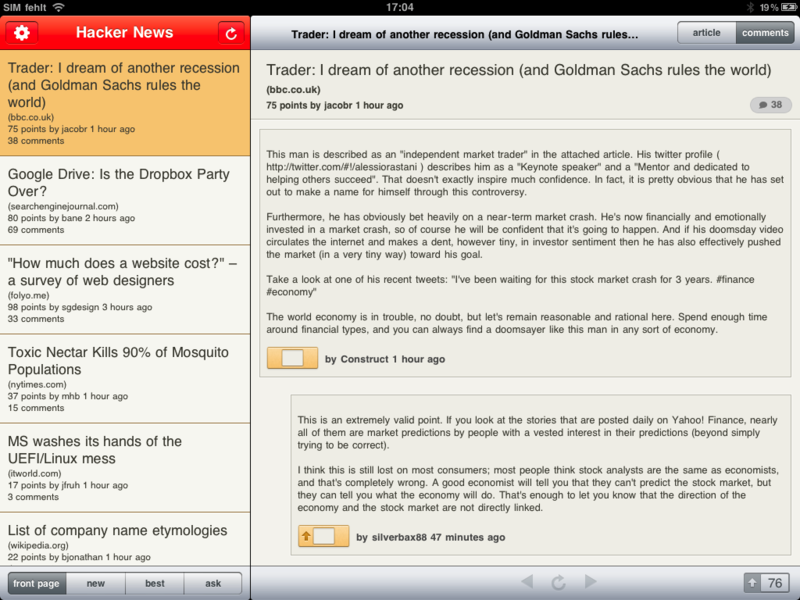 Hacker News PadReader isn’t awesome, but hey, it’s free! 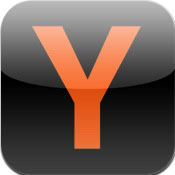 Stay away from Hacker News Reader and Hacker News!, unless the improve a lot. Update: As several people reported stability issues with Hacker News HD as well, HackerNews for iPad seems to be the only reasonable choice. 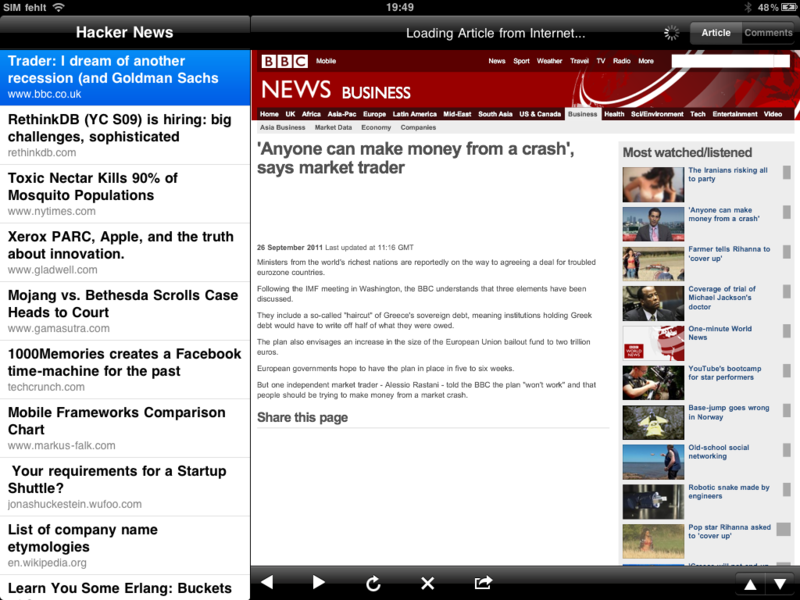 Or you can just stick with reading Hacker News in Safari *sigh*. 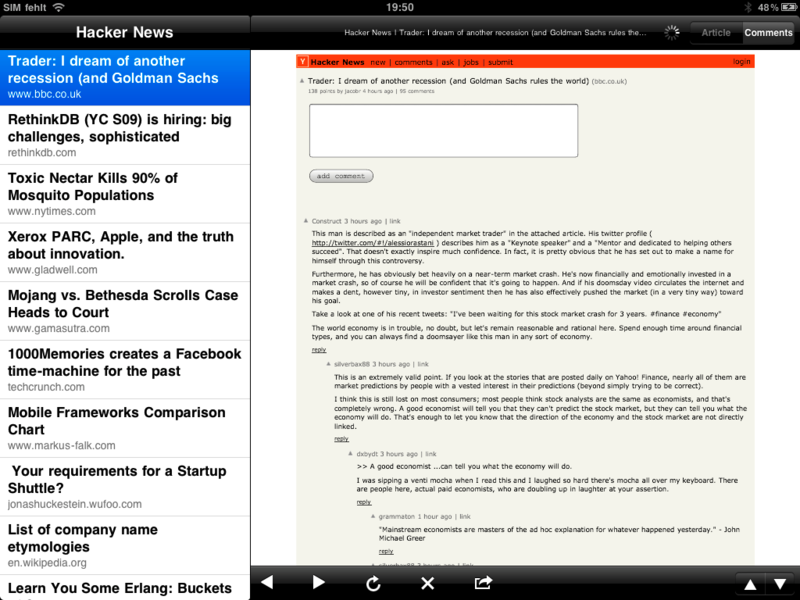 I like HackerNews for iPad best. 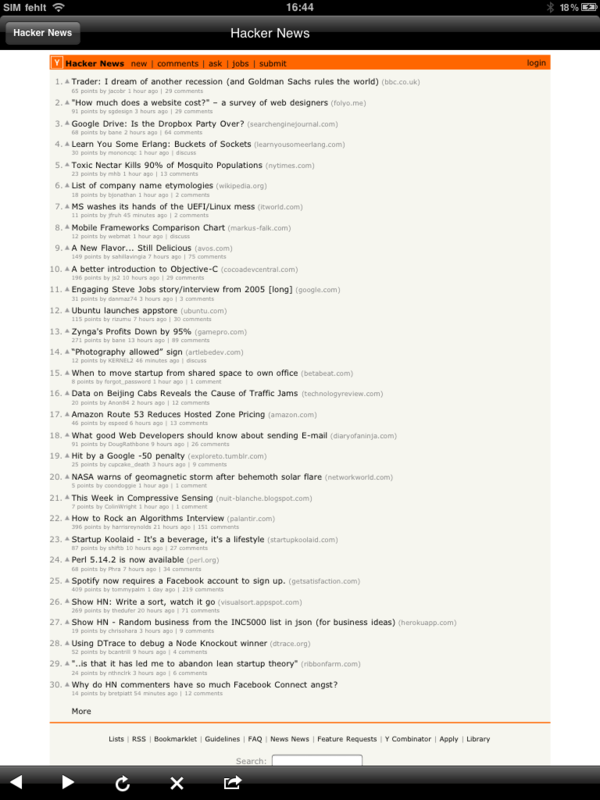 Hacker News HD is also good and has offline caching works for me, but crashes for other people. 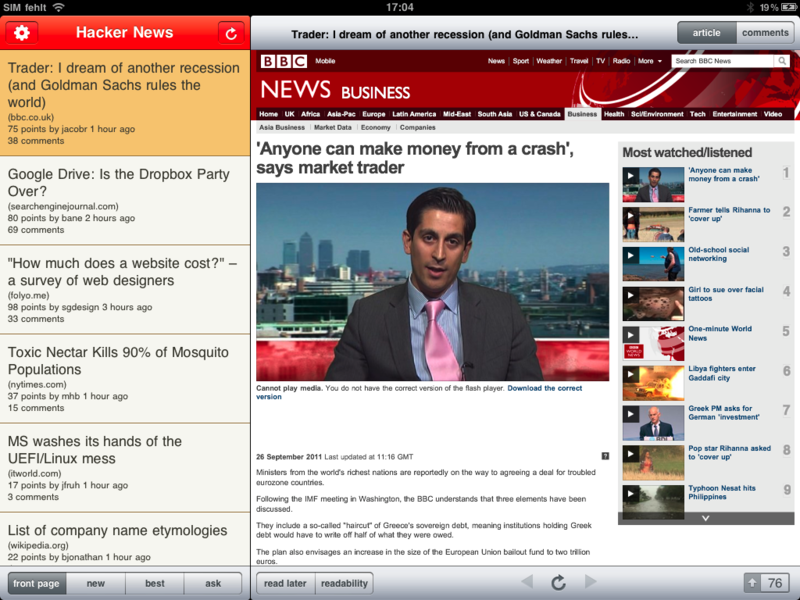 What are your experiences with Hacker News iPad Apps? Comment below or join the discussion on Hacker News. This entry was posted in Uncategorized by Daniel Hepper. Bookmark the permalink. 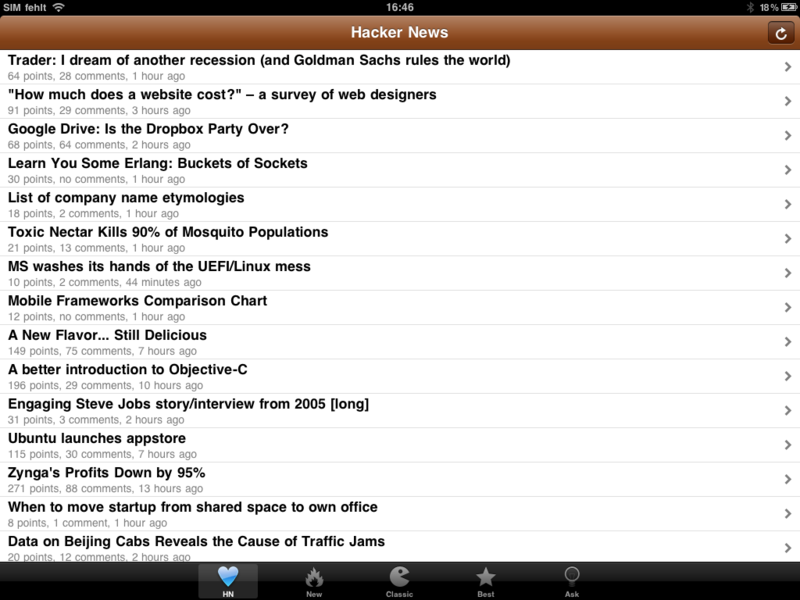 I just released a free iPad/iPhone app for reading HackerNews. It is designed like Twitter for iPad. Please do review it if you get time.